SE Asia Research – Do your dream! Wow. When we through this one into the kitty we thought it would be a fairly simple project. I mean, loads of people go backpacking, how hard can it be?! Actually very! There is a lot more to it than we thought, and there is loads of new things to learn about that we don’t need to consider in a van. When are we going? Getting back? Visas – where from, how long, etc? What route? Where do we stay the night, every night? How do we get around? Makes Europe in a campervan look trivial! 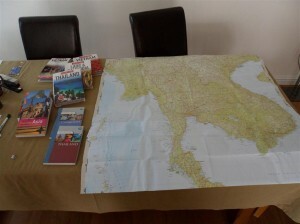 After chatting to people on the Lonely Planet forum we have decided to focus on Mainland SE Asia, so mainly Thailand, Laos, Vietnam and Cambodia. A fairly well use trail and we can save places like Oz, NZ, Fiji etc for possible future trips. This also seems to mean we won’t have a need for a Round-The-World (RTW) ticket – just a return ticket to a major Asia hub, Bangkok or Kuala Lumpur and just blag it from there. And lots of reading to do!! No, this isn’t an ad for Amazon – we really have all these and loads to read! Whilst we think the Lonely Planet guides are in specific and in detail, we reckon the Insight ones are easier to read and have prettier pictures! The maps though are excellent, and if you only buy one map buy the Thailand one as it does cover mainluy the same area as Vietnam/Laos/Cambodia version. Hoping to book flights within a week (mid June 2011). Eek. Pingback: June aches & future plans!